One of the biggest mega trends impacting the world today is population aging. Today, 15% of the population in Wisconsin is over the age of 65, with the expectation of living an average of 19 more years. As our population in Hudson also ages, local seniors, baby boomers, and caregivers must find resources to help them live a vibrant and healthy life. Hudson Senior Expo is bringing a vendor fair with 30 local business, nonprofits, and county agencies together in one place, allowing seniors, their families, and care givers the opportunity to learn more about senior housing, healthcare, and financial services in Hudson and the surrounding area. As Realtors, my wife Becky and I often work with seniors and their adult children. We see them struggle to find the right housing situation that meets their needs and budget. It can be a stressful and emotional process for the entire family. 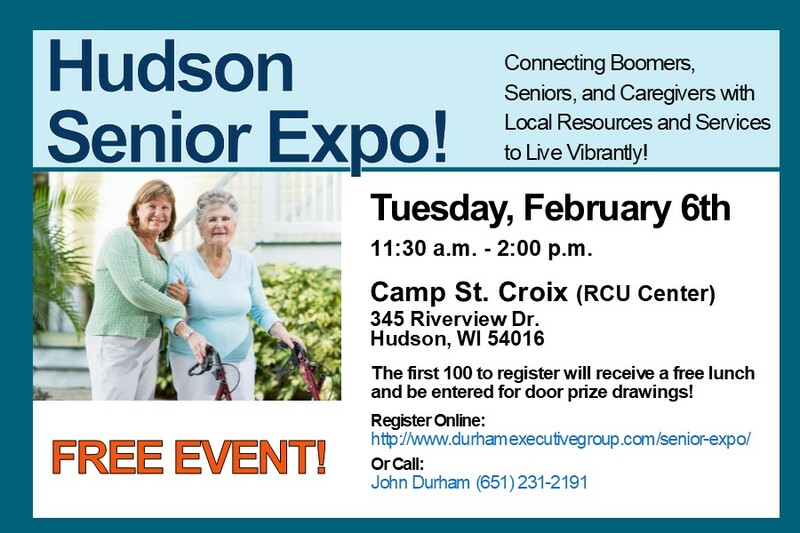 We created Hudson Senior Expo to lead the community in embracing Hudson’s growing senior population. Our goal is to connect Hudson’s seniors with local resources and services committed to serving seniors, so they can find the support they need. In addition to a vendor fair, local experts will give short presentations on topics important to seniors today. Brad Beckman, Director of St. Croix County’s Age & Disability Resource Center will speak on issues facing seniors as they age in place, and resources available to seniors in St. Croix County. Attendees will also hear from Mike Kojonen of Principal Preservation Services about Social Security and the new tax laws, Katie Kranz of Eckberg Lammers Attorneys at Law will speak about estate planning, wills, trusts, and power of attorney, and John and Becky Durham will talk about seniors aging in place or if transitioning to a Senior Living Residence is in their best interest. Two evaluations of the property are recommended in making the determination for aging in place. First, an evaluation is necessary to determine whether aging in place is appropriate. Secondly, a home equity evaluation will identify value of the home and whether the adaptations to the home have a return on investment. The first 100 people to register will receive a free lunch and be registered for door prizes. Our Sponsors: John and Becky Durham are the event organizers, providing logistics and marketing support. The Hudson YMCA has graciously donated the use of Camp St. Croix for the event, County Market is providing a lunch to the first 100 registered attendees and Hudson Star-Observer is providing marketing support. The response from the local business community has been inspirational! John and Becky Durham are a husband and wife Broker/Realtor team with RE/MAX Results in Hudson and Woodbury.